If you deliver content over the internet to a global audience and care about performance, you're likely using a content delivery network. CDN is a popular use case for advertising, media, online gaming, commerce, mobile, healthcare, even government and education because users can access web pages and apps much faster. 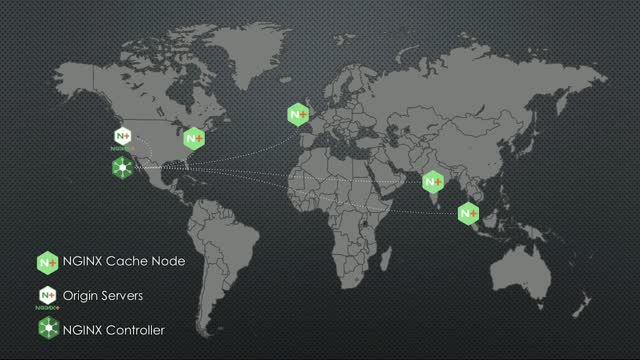 What you may not know is most major CDN providers use NGINX under the hood. Commercial CDN services can be expensive to scale, limited in fine-grain control and customization, and offer fewer performance optimizations that you would want. If your enterprise CDN bill is astronomically high, and you need more control and customizations, it will be more cost effective to build your own. Watch this webinar to learn how a CDN works, when it makes sense to build your own CDN, and jump into a technical deep dive on how a CDN solution performs with NGINX Plus, with performance comparisons and a live demo. AWS deploys code every 12 seconds. Fidelity, a large financial services corporation, has reduced release time from days to just 1-2 hours. How did these enterprises achieve such agility? The obvious answer is embracing DevOps -- including agile processes, DevOps tool chains, and a culture of continuous integration and continuous delivery (CI/CD). But world-class companies go beyond surface-level DevOps adoption. They’ve embraced technologies that build on containers, microservices, and modern application architectures. Whether you’re “cloud native” or “webscale” or not, you can still learn lessons from companies that have paired DevOps with the right application infrastructure. NGINX has experience working with the largest, most successful digital pioneers in building out modern application architectures. As one of the most widely deployed open source projects of all time, NGINX has a unique vantage point between the world of developers and operations. Infrastructure & Operations and DevOps teams have to grapple with many challenges as their enterprises’ APIs gain wide adoption both internally and externally, and the number of APIs and API gateways increases. APIs need to be managed in an efficient manner across their entire lifecycle, and API gateways need to be updated with the latest API policies. API management includes defining, publishing, documenting, securing, routing, monitoring, troubleshooting, and analyzing the usage of your APIs to assess their value. Those management activities must not degrade the performance of the API gateway itself, which is responsible for routing and mediating traffic. That’s where NGINX Controller’s API Management Module comes in. The NGINX Controller API Management Module combines the raw power and efficiency of NGINX Plus as an API gateway with new control‑plane functionality. The result is a simple user interface that offers powerful functionality for Infrastructure & Operations and DevOps teams to define, publish, secure, monitor, and analyze APIs. Learn how to adapt the core ideas in the classic 12-factor application model to a modern microservices architecture optimized for continuous delivery. The use of an API gateway and the move to microservices are two of the most important trends in application development. But are they similar, or different; complementary, or contradictory? In this webinar we discuss the advantages of an API gateway, the advantages of microservices development, and how and when they can work together. This webinar is part of BrightTALK's I&O Tech Talk Series. Data center hardware and configuration are on the outs as technologies such as Infrastructure as Code (IaC) take shape. The world of manual processes and provisioning is disappearing before our eyes, and it's changing the way organizations are designed and modernized. Tune into this roundtable panel discussion led by Mark Thiele, Chief Strategy Officer, Apcera as they discuss the phenomenon of Infrastructure as Code and other emerging technologies, and how they are disrupting IT infrastructure and the traditional data center. This webinar is a chance to learn how the circuit breaker pattern is used in microservices applications. Fundamentally, the circuit breaker pattern in a microservice application is all about managing traffic to the different instances of your services. We utilize active health checks to monitor these instances, to help avoid catastrophic failure. Kubernetes has been taking the emerging microservices ecosystem by storm. Originally created by Google, and subsequently donated to the Cloud Native Computing Foundation (CNCF), Kubernetes has become the leader in container orchestration. The next generation of microservice infrastructures is here. Join this webinar to get all of your microservices, MRA and service mesh architecture questions answered. Bringing microservices and service mesh architectures to life in working code is a huge and novel challenge. NGINX makes this easier with Ingenious, a demo app that is part of the Microservices Reference Architecture (MRA). Ingenious works across multiple architectures, bringing the differences and advantages of each to life. In this webinar we discuss how Ingenious is (mostly) the same, but also the differences in its code, features, and runtime behavior, as it’s implemented in various architectural models. Great microservices applications are backed by strong APIs. But APIs are complex, and management solutions are expensive. -What is an API gateway? -Where does your API management tool live in your stack? -What new security concerns are being introduced by APIs and microservices? -What problems can an API gateway solve on your journey from monolith to microservices? Join this webcast with Charles Pretzer, Technical Architect, and Floyd Smith, Director of Content Marketing at NGINX as they answer these questions and more for migrating to a microservices architecture. When your content is valuable, and you’re rightly concerned about the privacy and security of your users, you can use NGINX to control and secure access to your services and the data that they manage. We’ll cover different ways you can use authentication, authorization, and security controls in NGINX and NGINX Plus to protect your code and content. In this webinar, learn about the Proxy Model, the Router Mesh Model, the Fabric Model, and the Ingenious app – all part of the NGINX Microservices Reference Architecture. Learn how to load balance your applications following best practices with NGINX and NGINX Plus. Learn how NGINX Plus supports service discovery and load balancing in the NGINX Microservices Reference Architecture (MRA). Learn best practices for installing, configuring, and troubleshooting NGINX and NGINX Plus. NGINX and NGINX Plus are leading software load-balancing tools, beating hardware ADCs on flexibility and price/performance. NGINX helps companies deliver their sites and applications with performance, reliability, security, and scale. NGINX offers an award-winning, comprehensive application delivery platform in use on more than 300 million sites worldwide. Watch this webinars how to ensure flawless digital experiences through features such as advanced load balancing, web and mobile acceleration, security controls, application monitoring, and management.